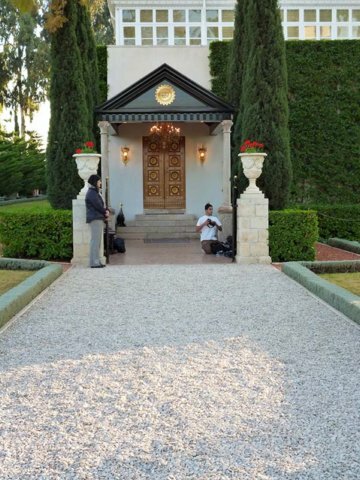 The entrance to the Shrine of Bahá’u’lláh – which is one of the holiest spots on earth for Bahá’ίs (the Shrine of the Báb being the other). This is where Bahá’ίs face (east) when saying our obligatory prayers – similar to Muslims facing Mecca. Praying in the Shrines (of Bahá’u’lláh and the Báb) was so peaceful and I felt welcomed by the Báb and Bahá’u’lláh (just as Their followers felt welcome when They were still alive and the believers visited Them). I prayed in the Shrine of the Báb about 6 times and in the Shrine of Bahá’u’lláh about 4 times – that is the main purpose of pilgrimage, to say prayers in the Shrines for one’s family and friends and one’s home Bahá’ί community, that one’s spiritual life will be enhanced and that one be able to serve humanity in the best way.